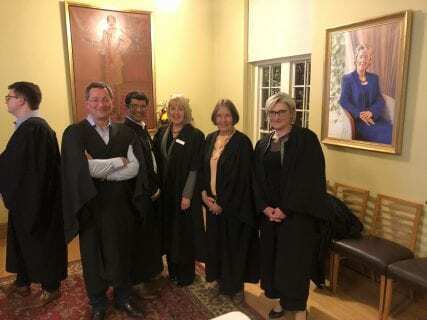 Head of College, Dr Jennifer McDonald hosted Professor Shitij Kapur, Dean of the Faculty of Medicine, Dentistry and Health Sciences at the University of Melbourne along with College Governors, Alumni and Students of the Faculty at High Table in Syme Dining Hall on Monday 27 August, 2018. As part of ongoing engagement efforts, University College is embarking on a broad engagement program including domestic and international activities and encourage community members to get involved where they can. Dr McDonald will be hosting the Dean, Faculty of Business and Economics and the Dean, Faculty of Fine Arts and Music (3rd September); the Dean, Melbourne Law School (17 September); as well as the Chancellor, the Dean, Melbourne Graduate School of Education and the Dean, Faculty of Arts (1st October). If you have recently moved and would like to ensure you receive the most up to date invitations, please update your contact details.